(From Carl Zeiss lens literature) By introducing the Distagon T* 1,4/35, Carl Zeiss is complementing the Planar T*1,4/50 and T*1,4/85 lenses with a wide-angle lens that shares the same high speed. Crisp, sharp images work every time, whether at dusk or in the weak lighting conditions of a café, and without the need for a tripod. With its 35-mm, the Distagon T* 1,4/35 matches the classic and versatile standard focal lengths when used on cameras with APS-C sensor formats. Due to the special bokeh effects in both the foreground and background areas, the Distagon T*1,4/35 opens up new creative possibilities, giving photographers more options to 'play' with focus. Thanks to its large focus ring, photographers can also create highly accurate, sharp pictures, even at maximum aperture opening. In addition, the optical construction of the lens guarantees high image quality across the entire image range. Furthermore, with one step less than the full aperture opening, the light fall-off toward the edges is just one f-stop. With the ZEISS T*'s anti-reflective coating, its sophisticated stray light reduction and the excellent flare control the new Distagon also takes pictures of bright light sources without artifacts. The Distagon T*1,4/35's extremely long-lasting and robust all-metal precision mechanics, for which Carl Zeiss is known, make this lens perfect for use on-the-go and for photo reports. The Distagon T* 1,4/35 will be available in first quarter of 2011. This is one of my favourite gear, has a colour rendition simply astonishing!! I shoot 3/4 of time at 1.4 and there's a very very good detail in the focused area with an extremely pleasant bokeh.. The gear is made with the high zeiss-cosina standard glass and brass, the focus ring is fantastic. Some CA at 1.4. It's an unbelievable piece of glass. The Zeiss coating is just different than others. I can't explain what it is but this lens renders images beautifully. Contrast, colors, sharpness etc. etc. are all top notch. I simply love this lens despite the fact it's a manual focus lens. Zeiss website shows movies on how to deal with that (if you're not familiar with manual focusing) and how/where to get focusing screens for your camera. The lens is all metal (including the hood) so it's heavy but the images it produces make you fly so don't worry about its weight. Search for images from Joshua Tree Park, they are all taken with Zeiss 35mm f/1.4 lens. the best lens ever made , sensational central sharpness , very well made, very precise focus ring. size (a bit too big), weak flare resistance. this is an outstanding lens and best 35mm prime ever made by any one. its central resolution is just insanely high even at f1.8, even at f1.4 , it is usable and sharp (at least in the center of FF). my copy is a ZE version and I would probably buy a ZF 2 version as soon as it becomes available here. 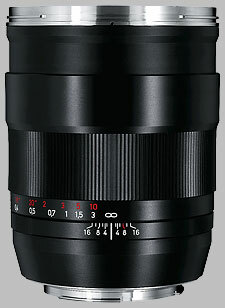 it peaks at f4-5.6 and stays in excellent to outstanding through f11. the distortion level with this lens is very low and the as lenstip says ,probably the best controlled in this class of primes. CA is also well controlled but bokeh fringe is quite noticeable from f1.4 to f2.8. So, it is an amzing lens. I love this lens although it flares quite often. only one issue in real life use might be the size and weight. I dont mind the weight but it is huge , wish it were a bit smaller (shorter).